The congress on the dialectics of liberation begins and ends with two words: radical education. Most commentators forget this, as they assume that it was inspired solely by anti-psychiatry. But, in fact, without Joe Berke’s interest in radical education there wouldn’t have been a congress at all, and without the congress there would not have been a (London) anti-university. The purpose of this brief article is to look at what the phrase ‘radical education’ meant in the 1960s, and then to relate that concept to the congress. The phrase ‘radical education’ was not often defined critically during the 1960s, though its meaning was pretty clear to those in favour of it. Briefly, it denoted a cluster of attitudes, positive as well as negative. Radical educators were for anarchism or Marxism, for freedom of choice, for young people, for civil rights, for the Cuban revolution, for avant-garde art, for the free expression of sexuality and for creativity and spontaneity. They were against capitalism, against bureaucracy, against authority, against an over-reliance on technology, against the Bomb, against the war in Vietnam and against the established universities which they saw as lacking intellectual and social integrity. Joe Berke’s involvement with radical education began at medical school in late 1962 or 1963, at the same time as he was writing poetry and hanging around with libertarian mad caps like Tuli Kupferberg and Allen Ginsberg. Like many students in those days, radicalised by injustice and poverty (not their own), he found his teachers (though not all of them) arrogant and authoritarian, and their teachings (though not all of them) either wrong-headed or just plain irrelevant. His own speciality, psychiatry, was, he claims, taught as if it was a type of natural science, like chemistry or physics, with a labelling system, and with little attention paid to the ‘totality’ of patients’ experiences. Not surprisingly, therefore, he became particularly attracted to ideas coming from outside the higher educational mainstream, which seemed to offer meaningful alternatives. As for Trocchi, he influenced Berke via his Project Sigma, which consistent with his Situationist International past, was nothing less than an attempt to revolutionise contemporary existence. Like Berke, Trocchi was a friend of Laing, enrolling him and David Cooper and numerous other supporters in an ‘invisible insurrection of a million minds’, with the object of seizing the ‘grids of expression,’ which is to say, the media and the other forms of mental production. One of the first post-fifties free universities was the Free University of New York (FUNY), and Berke was involved with that too as an organiser and a teacher. There is a letter from him to Laing, written during the spring of 1965, in which he says ‘Am starting university in NY this summer’; as simple as that, with no supplementary explanation, but by which he undoubtedly refers to the founding of FUNY. FUL did not succeed, however. In Jeff Nuttal’s words, it fell victim to the ‘yawning gaps existing between the English Underground, the English left-wing liberals, and [Berke’s] “professionally” defensive colleagues in the Philadelphia Foundation (sic)’. This was a hit at Cooper and Laing and the other members of the Philadelphia Association, who refused at that time to go along with Berke’s plan to use Kingsley Hall for his weekend lectures. Nonetheless, a spark was lit, and when a year or so later, Berke came up with another, similar, idea, Cooper and Laing jumped at the plan, seeing it as a further development of their anti-psychiatric interests. Berke began planning for the congress during the late spring or early summer of 1966, at about the same time as he moved out of Kingsley Hall and into his own flat facing Primrose Hill, a part of London which would long have radical educational and anti-psychiatric associations. One of the first times we hear of it, is in a letter to Allen Ginsberg, in which he mentions the recent foundation of the Institute of Phenomenological Studies (IPS). This was a curious body. Laing’s son, Adrian, who knew Cooper very well, describes it in his life of his father as a ‘sort of trading name’ for the four founding ‘organisers’ of the congress (and when, on a recent occasion, I mentioned it to Berke, he laughed). It therefore seems not to have had much in the way of a tangible existence. Nonetheless, it was and would remain the public face of the congress. When, for instance, Berke’s American colleague Leon Redler wrote to Stokely Carmichael, the, increasingly radical, chairman of the Student Nonviolent Coordinating Committee (SNCC), in a letter of October 1966, inviting him to attend the congress, he mentioned it as representing an ‘extension’ of the foursome’s work in ‘seeking to demystify communication in families of schizophrenics, and in so doing to seek to liberate those imprisoned in such nexes’. Berke carried forward FUNY’s educational imperatives into the congress by marshalling a similar mixture of ‘politicos’ and ‘culture wizards’, the former ‘SUPER-LEFT with a vengeance.’ Many of the politicos were veterans of the May 2 Movement, which had been formed to spearhead students’ fight against United States involvement in Vietnam, and they brought to the congress a fundamentalist and extremely aggressive anti-Americanism. 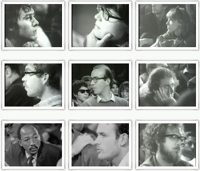 Of course, violence and liberation from violence were the main topics at the congress, but these too was given a radical educational spin, as speaker after speaker, both from the platform and from the floor, drew their audiences around to the radical educationalists’ New Left agenda. It was, for instance, always the white man’s violence that was condemned, almost never the black man’s. Thus, Stokely Carmichael damned the west for a multiplicity of sins, whilst ignoring Africa’s own role in fomenting its parlous and unstable condition. Today, higher education is even more bureaucratised. Students are over-regulated and over-assessed. They are offered degrees, not the benefits of wisdom. Once again, they are to be fitted for an ever-more inhospitable workplace. The question therefore arises: does radical education have anything to say to students today? If it has, it would not be the first time that recent history has thrown up a radical and exciting possibility.